A targeted antibiotic that acts as a ‘Stealth bomb’ could wipe off infections caused by microbes that are resistant to most drugs according to mice studies. Sanjeev Mariathasan and a team of scientists at Genentec, California, have come up with this strategy of gluing an antibody against Staphylococcus aureus to a modified version of rifampicin. This concept is borrowed from cancer treatment, where an ‘antibody–drug conjugate’ docks onto cancer cells before deploying its cancer-killing payload. Infections caused by methicillin-resistant Staphylococcus aureus (MRSA) are difficult to manage with commonly used antibiotics and are responsible for significant morbidity and mortality rates. 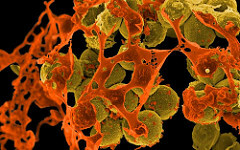 S. aureus is difficult to target and to eliminate once it invades the cells and that is where the antibody-antibiotic combination drug was found to be highly effective. When mice were infected with MRSA and treated with a control drug and with this experimental combination drug, it was found that the experimental drug was about a thousand times effective against MRSA. The mechanism of action of this combination drug is interesting that, first the antibody component docks onto the bacteria in the mouse’s body and as the bacteria invade cells, the therapy travels along. Once inside, the antibiotic is activated where it is required to kill the pathogen. However, it is to be noted that the immunopathological mechanisms could be different in human body and also that, those chronically infected with S. aureus, would already have antibodies to it which could interfere with the binding process. Further studies are required to evaluate if this experimental drug would work in humans and if it works, it could open doors to newer therapeutic avenues where large resource of antimicrobial drugs that had not survived the pipeline could be brought back.